If snow hasn’t been falling on your local ski slopes it will be soon, which means it’s almost time to dust off that winter ski and snowboard and think about heading to the mountains. But first you’ve got to get in the proper frame of mind. There’s no better way to get pumped for ski and snowboard season than by watching some epic films. After perusing a wide selection of trailers we’ve come up with the best ski and snowboard films of 2016. From Teton Gravity Research comes an homage to 21 years of producing some of the best ski flicks on the planet with its release Tight Loose. Celebrating TGR’s 21st birthday, this film is acclaimed as the group’s highest achievement to date, bringing viewers to the backcountry of Alaska to India on this reunion style tour de force of all things tight and loose. This Red Bull film follows the story of Travis Rice, who sets out with some friends on a 16,000 mile journey in search of powder. Similar to the way big wave surfers follow weather patterns, Rice and his friends use hydrological cycles of the north Pacific to find some of the planet’s best snowboarding terrain from the Japanese Alps to the volcanoes of Russia. For a film that’s more than a ski flick we highly recommend Ruin and Rose. Taking place in a futuristic world devoid of water and consumed by sand, the film imagines what happens when a young boy discovers a relic hinting at a world of mountains and powder and epic skiers. It’s a bold cinematic expression not without some overt symbolism about our current climate situation and one that will no doubt have you ready for a lift ticket. Getting back to the nitty gritty of why we love snowboarding films, Transworld Snowboarding delivers this year with its film Insight. Bringing you big airs, morphing snow and skate tricks, this diverse cast of talented boarders share their adventures among some of the most stunning scenery on the planet. You can’t have a list of skiing films without including the grandfather of the genre, Warren Miller. At 92 years of age, Miller is not behind the camera as much as he used to, but the team at Warren Miller Entertainment continues to produce some beautiful ski films. There’s nothing like a Warren Miller film to get you ready to hit the powder. Check out their newest release Here, There and Everywhere. For a ski film on the lighter side, from Level 1 comes a film entirely about wiping out. From concrete walls to railings and every in between, this film is nothing but back breaking hedonistic enjoyment. The goal of the producers of Here and Now from 4FRNT was to present a world without mobile devices, where friends share magical interactions on the mountains. By bringing us the fun-filled adventures of this band of misfit skiers, viewers can escape social media for a moment and bury their heads in this movie instead. featuring world class urban, park and backcountry skiing, all with their trademark fun style. Full Moon from Runway Films takes an inspirational tone by showcasing the world’s leading female boarders as they travel the world for two years riding backcountry. 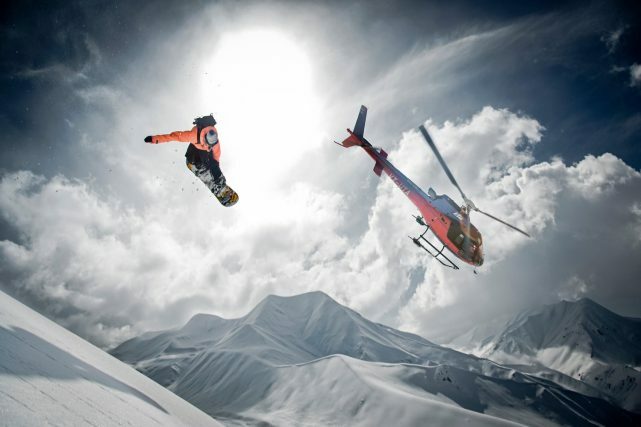 From Nitro Snowboards, Boom! is a film that attempts to capture the lighter side of snowboarding. In co-productiong with Red Bull Media House, this is the fourth film by the team at Nitro.